Another thing I have learnt through this cooking challenge is that you should always check the size of your equipment (*cough*) before proceeding with recipe. The Boyfriend returned on Monday, so to celebrate this and to welcome him back with some delicious homemade food after 2 months of eating out in fancy restaurants (I know, how awful for him), I cooked him roast dinner (pork, his favourite) and a banana cheesecake from Nigella Kitchen. The roast dinner was delicious, crackling crisp and salty, potatoes crunchy on the outside, fluffy in the middle and veg still with some crunch. I even managed not to screw up the gravy which I am normally appalling at. Even when being lazy and using Bisto granules I somehow screw it up, and making it from scratch will alway, always, always end in disaster with either little lumps of cornflour floating in it as a last resort to help thicken it, or a layer of grease floating on top of the gravy, both of which are most unappetising. The Boyfriend makes cracking gravy, which is a wasted talent as he is never at home to make said gravy! So at least the main event was delicious, as the dessert was not. How does one mess up cheesecake, you ask? Well this is how: by ignoring the advice bestowed on me by the ever reliable Nigella and thinking everything would be OK. It was not OK. After making the cheesecake, I was supposed to place my springform tin containing the cheesecake into a roasting tray and then fill the tray with boiling water to create a water bath. This stops the cheesecake from overcooking and becoming dense and un-fluffy. I didnt have a roasting tray that could accomodate my tin, although this did not stop me from attempting to break the laws of physics by using force and sheer willpower, but after a lot of trying, the tray was just not big enough. So I thought ‘whats the worst that could happen?’ and chucked the cheesecake, sans water bath, into the oven. If you have to ask ‘whats the worst that could happen?’, then you probably shouldnt do it if the answer scares you. This applies to cheesecake making as well as other risky activities such as swimming with sharks (being eaten) or bungee jumping (the cord could break and I could land in crocodile infested waters – true story, but thankfully not experienced by me). Result of this barefaced insolence? Dry, mealy cheesecake that looked more grey than yellow and that’s scary stuff when you want to welcome someone back not make them wish they were still 5000 miles away! It did taste of banana but the texture was not great. It should have been fluffy and light but was nowhere near. I should also have made a toffee sauce to pour over the cheesecake to make it banoffee like in Kitchen but it really would not have been worth the effort. This may be the longest time a cheesecake has sat in my fridge, with only one measly slice eaten. It’s a sad day for cream cheese, I can’t even bring myself to post a photo of the thing! I may have to move on from baked to chilled cheesecake in an effort to get over this defeat. But at least The Boyfriend is back for a few weeks, which made me feel a whole lot better about the failed cheesecake. Now just have to get through two more days at work and then we have a whole week off together, bring on 5pm Friday! So today I finally got round to baking after getting the oven fixed last week. The parents came round for some lunch, which I saw as a perfect opportunity to tick off a couple of recipes on the list. The recipes I chose were lamb samosas from Rachel Allens Favourite Food At Home, and pineapple cupcakes with a lemon cream cheese frosting from Irresistible Cupcakes by, err, Next! Making the samosas was fiddly work, I used ready made filo pastry and pretty much as soon as I’d got the pastry out of the bag I’d torn it. 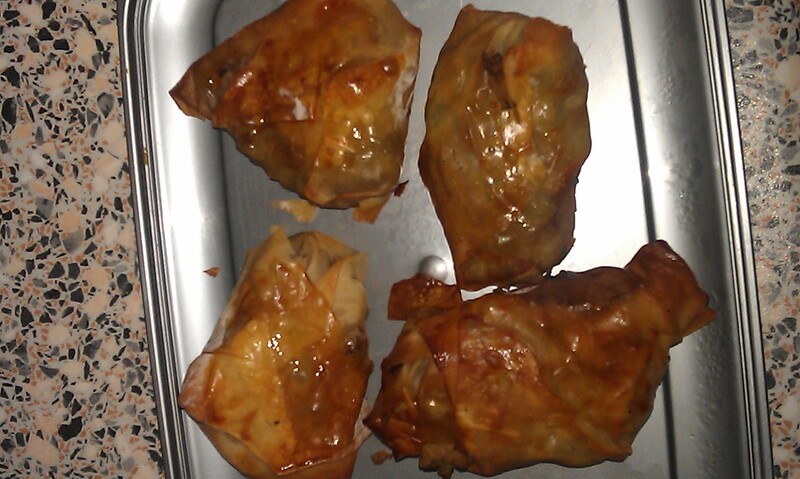 Luckily it was salvageable, but it made for interesting looking samosas. I lack finesse at the best of times when it comes to cooking (who am I kidding, when it comes to anything! ), so working with torn pastry took away any finesse I may have had. If I was on Masterchef – which I never would be because I’m not a masochist – John Torode would have a heart attack at my lack of presentation skills and my disgracefully messy cooking style. It aint pretty! Luckily I am not on Masterchef, and my dad and step mum do not expect Michelin standards of me. They’d be very disappointed if they did. Anyway, enough about me and back to the samosas. 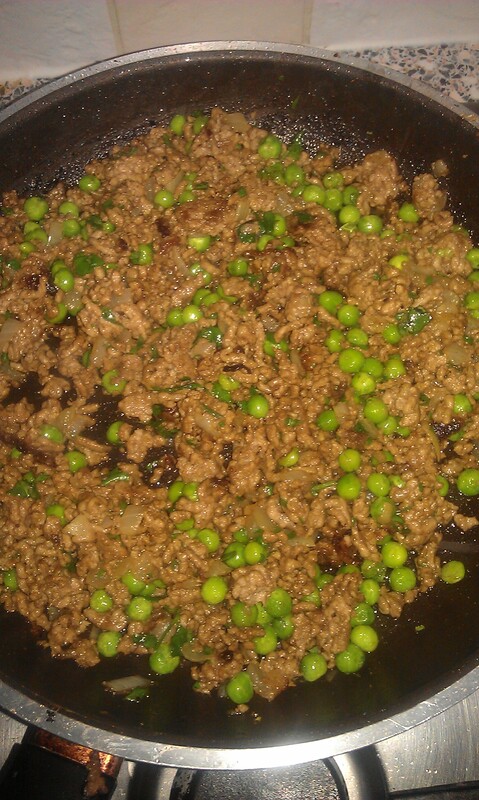 Despite the fact that they were stuck to the pan, leading to an escaping lamb/pea situation, they were pretty tasty although they could have been a bit spicier. Everyone seemed to like them, and there are plenty left to snack on through out the day. With the samosas I also served ham (cooked in cherry coke) baguettes, mini duck spring rolls and spicy prawns (these were from Tesco, I have a limit to how many nibbles I can make myself in one morning). Not a bad spread. Onto the cupcakes. These were from a book that todays guests bought me as a Christmas present, and my opinion on them was that they were a little bit dull. I adore pineapple, and even though it had chunks and juice from the fruit in it, it just didn’t taste enough of pineapple for me to love it. 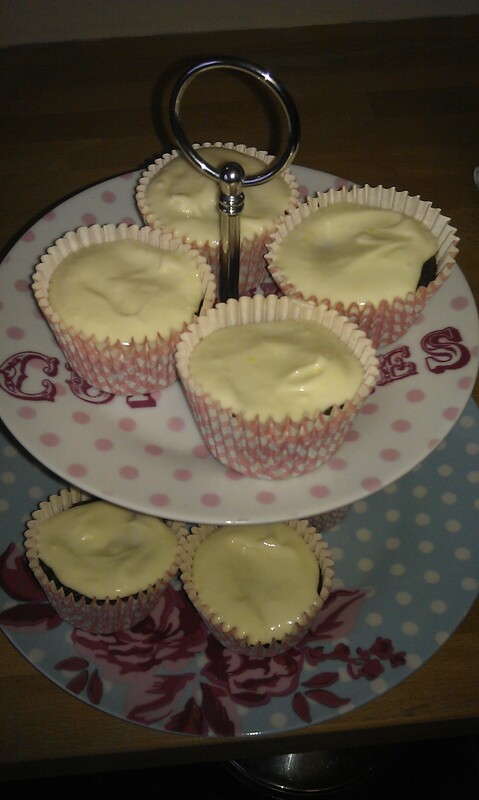 The cream cheese frosting was delicious and lemony, and without this the cakes would have been instantly forgettable. I don’t know if I feel this way because they genuinely are tasteless, or because I know someone who makes the most amazing cupcakes I’ve ever had, and therefore all cupcakes pale in comparison to her creations. I’m not kidding, they are delicious, and look amazing and are covered in the most decadent icing ever. She has wisely gone into business with these bad boys. My personal favourite is the mint chic chip flavour that she does, immense and a very popular choice amongst the lucky people to have eaten them. So perhaps my cupcakes were always doomed. But as I’ve got 2 more recipes from this cupcake book to cook, I will assess the cupcake situation at the conclusion of this challenge. Its still too soon to call! I’m hoping that eventually I will cook something in this challenge that I actually love, as other than the chicken fettucine a few weeks ago, I’ve not had much success. Fingers crossed next week will improve, I’ve got some lovely sounding recipes planned so I have high expectations!